Myrtleford, a rural town in north-east Victoria, is 50 km south of Wodonga. It is situated on the Ovens Highway, near the junction of the Ovens and Buffalo Rivers, and is usually approached from Wangaratta. The site of the township is a few kilometres east of the rivers’ junction, and the precise local streams on the township’s perimeter are the Barwidgee and Happy Valley Creeks. The former’s downstream waters were named Myrtle Creek until 1963. It was this short stream which gave the town its name: ‘Myrtle’, apparently because of trees of that specie; and ‘ford’, presumably from a crossing place on the creek. European occupation of the district was John Hillas with his Myrtle Creek pastoral run (1837) which extended east from the junction of the Ovens River and the Barwidgee (Myrtle) Creek. Soil and climate favoured intensive cultivation and, providing noxious plants and animal pests were repelled, good crops were obtained. Dredging of the Ovens River downstream from Myrtleford in the early 1900s probably caused a net loss to the town: the transitory employment was offset by the loss of alluvial soil that was overturned by dredging. An unexpected side benefit was the establishment of pine plantations, originally on dredged land upstream in 1915, and first planted at Myrtleford in 1927. A gradual growth in the town’s population was accompanied by a farmers’ co-operative store (1922), a convent and Catholic school (c1923), a memorial hall (1925) and a golf course (1928). In 1939 a form of biological control of St Johns Wort was found and used to good effect. During World War II Myrtleford was one of several camps for holding Italian prisoners of war. Some were employed as farm labour, and their presence was a foretaste of a postwar influx of southern European farmers. Many of them started tobacco farms, an industry which had fallen on lean times in the 1930s because of imports but which experienced instant demand when the war stopped imports. In the late 1940s the Ovens Valley and tributary valleys were planted with tobacco. Myrtleford, at the convergence of at least four valleys, became the region’s tobacco-growing centre. The landscape was soon dotted with drying kilns. A State tobacco-research station was opened in 1950 east of Myrtleford. The Victorian Tobacco Growers’ Association, with a membership of 1000, was headquartered at Myrtleford. All these events followed on from the reduction of the rabbit population by myxomatosis in the early 1950s. 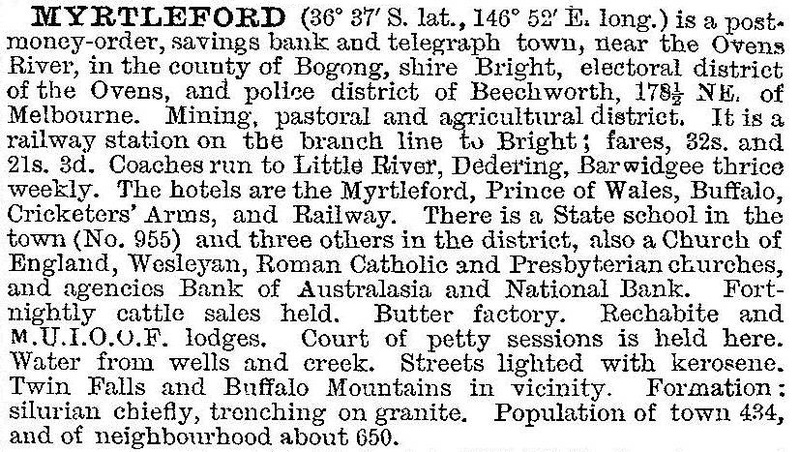 Between 1954 and 1971 Myrtleford’s population grew by 80%, to 2741 people. The town’s amenities expanded correspondingly: the bush-nursing hospital was replaced in 1959 with a war-memorial hospital, free of debt by local fund-raising; a high school was opened in 1960; an additional reservoir for town water was built in 1971; and on 31 May 1960, Myrtleford shire was created by severance from Bright shire. The shire had the township at its northern end along with the Happy Valley Creek watershed. It then ran southwards between the Buffalo River and the Mount Buffalo summit ending in the alps near Mount Selwyn. Until the 1980s Myrtleford’s tobacco-growing and other agriculture were profitable. The Buffalo River dam (1965) about 20 km to the south gave irrigators additional water. Tobacco was supported by a protective tariff. During the late 1980s, production quotas were reduced and the areas under crop in Victoria were reduced from 3394 ha (1980) to 1890 ha (1990). Quota buy-outs reduced the area to 1240 ha by 1994, and most of the reductions were at Myrtleford. Although Myrtleford had projected itself as the gateway to the Alps – the Buffalo plateau is immediately south – and the Myrtleford Ski Club had a long history, the bulk of alpine tourism moved east to Bright, Falls Creek and Mount Hotham. Agriculture in the 1990s faced the challenge of diversification into other crops. Hops and nut orchards were successful elsewhere in the Ovens Valley. In 1994 farming occupied 18% of the shire’s area, and livestock numbers were 11,900 meat cattle, 2000 dairy cattle and under 1000 sheep. Myrtleford is a significant commercial centre with about 60 shops, three hotels, two motels, a visitor-information centre, a hospital, a showground, a weekly newspaper, a consolidated primary school, combined with a high school (266 pupils, 2014). There are also Catholic primary and secondary schools, and the European Catholic influence is further evidenced by a soccer club. Tourism compared unfavourably with neighbouring Bright: in 1995 Myrtleford had three hotel/motels and two caravan parks compared with ten motels and four caravan parks in Bright. There is a full range of sporting facilities, including a golf course and a swimming pool. There is a rail trail on the former railway line to Bright (1883-1987). It attracts cyclists who can also stop at the Butter Factory restaurant (2010) on the Great Alpine Road. Myrtleford can be viewed from a lookout on Reform Hill, set in pine-tree plantations that extend many kilometres eastwards. On 18 November 1994, Myrtleford shire was united with Bright shire and parts of Beechworth, Omeo, Oxley and Yackandandah shires to form Alpine shire. The administrative centre is in Bright. Myrtleford’s demography changed quite significantly during 1981-96. The proportion engaged in agriculture fell and the proportion engaged in manufacturing rose. In 2011 the Myrtleford sawmill was converted to a new plywood mill using pine from plantations in north-east Victoria and employing about 160 workers. The old Tobacco Cooperative building was purchased the same year by a flour mill consortium. At the 2011 census the proportion affiliated with the Roman Catholic church was 42.6% (Australia 25.3%).